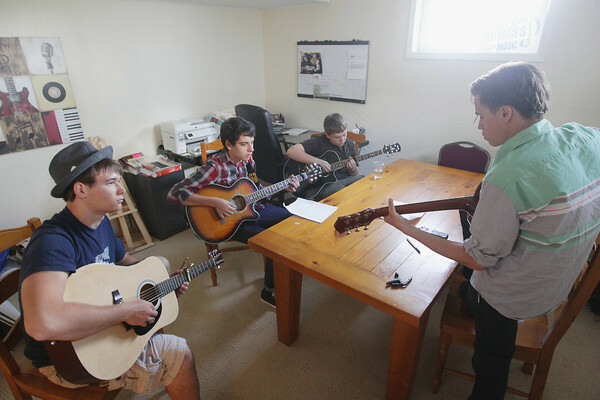 Students with Seeking Ecology Education and Design Solutions (SEEDS) John Grocholski, from left, 17, Zak Watson, 15 and Ben Kolk, 15, use their guitars as Graham Parsons, with Earthwork Music, teaches them how to play a song by musician Pat Carroll Tuesday, May 21, 2013 at the Grand Traverse Circuit building on 14th Street in Traverse City. The students, with help from musicians along with Earthwork Music, were learning songs from an album by Pat Carroll titled, "Glow in the Dark." The songs are to be played at a listening party for the album and for Carroll, who is awaiting a lung transplant due to cystic fibrosis.